Introducing a compilation of favourite scripture stories for children aged 3 to 7 using simple yet appealing animation, soft music, tender and gently pace narration presented in simple, understandable words. 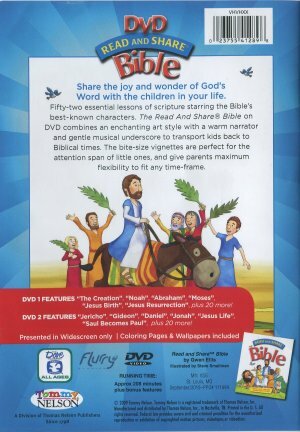 The DVD Bible lets children experience the wonder and joy of God and the Bible. This DVD features more than 3 hours worth of 52 Bible stories - from Genesis to Revelation. The DVD stories are told with charming animation, friendly narration and a wonderful soundtrack that will welcome children back to exciting biblical times. Children will meet all of the best known characters from the Bible and encounter stories of faith, love, betrayal, selflessness and a range of other valuable life-lessons. 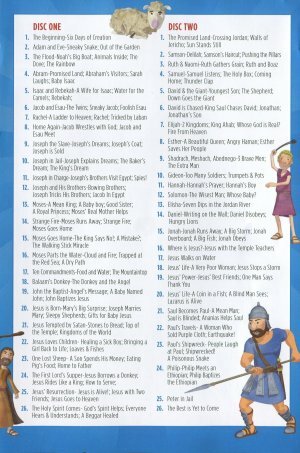 ...and 42 other incredible Bible stories! Each story is a bite-size length that is a perfect combat for children's short attention spans! Read And Share: DVD Bible Box Set by Thomas Nelson Publishers; Gwen Ellis was published by Thomas Nelson in September 2010 and is our 1356th best seller. The ISBN for Read And Share: DVD Bible Box Set is 9781400314713. Be the first to review Read And Share: DVD Bible Box Set! Take a peek at some articles related to Read And Share: DVD Bible Box Set. Got a question? No problem! Just click here to ask us about Read And Share: DVD Bible Box Set. What age group is the DVD suitable for? A:The 'Read and Share' DVD series is aimed at children aged 3-7; the discs are produced in multi-region format and will play on all standard UK machines. What is the average duration time of each story? A:Each of the 52 Bible stories lasts approximately four minutes. Can you please supply a complete list of all the stories in the Bible box set? A:The complete list of all 52 stories appears as a pack-shot on the Eden product page (product 3772057) for the boxed set. Clicking the enlarge button makes it just about clear enough to read. The most loved stories are listed in the product description. How long is each story on the Read And Share DVD Bible Box Set? A:Each story runs for approximately 3 minutes. Are the stories in the Read And Share: DVD Bible Box Set fully animated? Is the DVD spoken in UK English or US accent? A:Narration for the Read And Share DVDs feature 'soft' American accents. What age group is the Read And Share DVD Bible Box Set aimed at? 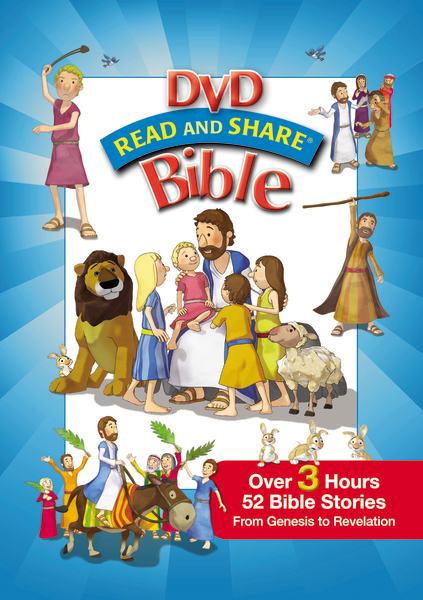 A:The Read And Share DVD Bible Box Set is aimed at children ages 3-7 years old. What age group is 'Read and Share DVD Bible Boxset' aimed at? Does this DVD, and the other DVDs in this series, have subtitles? A:No, these titles do not feature subtitles. How many DVD's does the box set include and what are the titles of each DVD? A:This DVD contains two discs, with fifty-two stories from the books of Genesis to Revelation. Disc 1's titles include The Creation, Noah, Abraham, Moses, Jesus' Birth, Jesus' Resurrection, while Disc 2 features Jericho, Gideon, Daniel, Jonah, Jesus' Life, Saul Becomes Paul and many more.